Alport Castles is a gritstone outcrop in the Derbyshire Peak District and is part of a vast landslide that spreads more than half a mile in distance, the main gritstone stack is called The Tower, its name is due to the resemblance to a castle tower as seen from below and especially more so from a distance, there are other smaller mounds and stacks with unusual shape and size, but the most interesting and stunning stack is, for me The Tower. 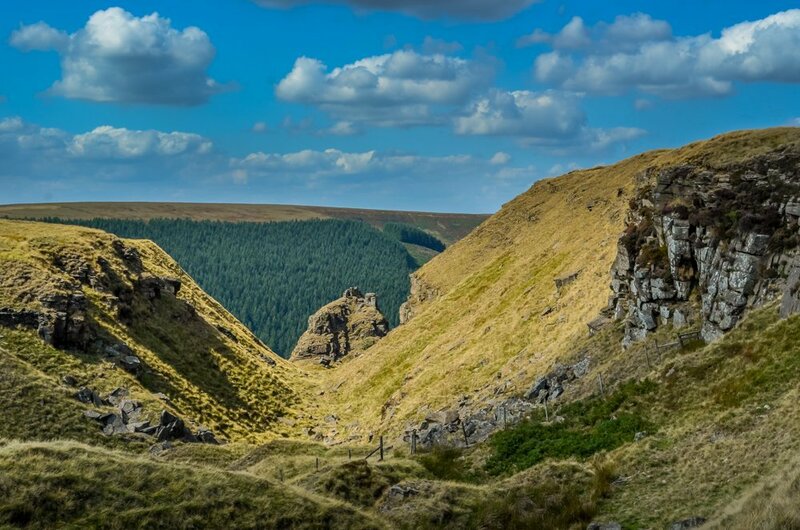 Alport Castles landslide has been selected for geological conservation and is thought to be the largest landslide in Britain. 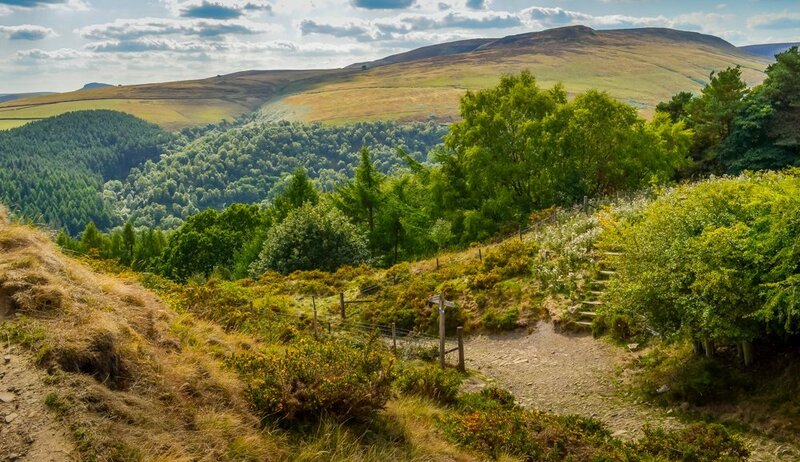 Another renown historical landslide is located at Mam Tor, close to Castleton village in the Peak District. Down in the valley below Alport Castles is the A57 Snake Pass road and when viewed from up high it is easy to see the contours of the valley as it snakes through the landscape. The River Alport is in the valley and flows from Bleaklow, down to Alport Bridge and finally joins with the river Ashopton. On the river Alport is Alport Farm where the Suffragette, Hannah Mitchell was born in 1871 and where she grew up. We had the perfect weather for walking, a mixture of sunshine and cloud, with just a small breeze, enough to feel refreshing as we walked the 15km, (9.5miles) an enjoyable walk up to the rugged Alport Castles and back down towards the lovely Ladybower reservoir where we had parked, a walk that has my favourite kind of views over hills, valleys and moorland up high. We were all booted up and carried plenty of water for all, including dogs’ water, (dogs need a good supply of water on a walk too. I also bring their snacks.) We had packed lunches to go, plus a bar of chocolate of course! I always bring a couple of fully charged power banks with me and rain-proofs rolled up in our back packs just in case. 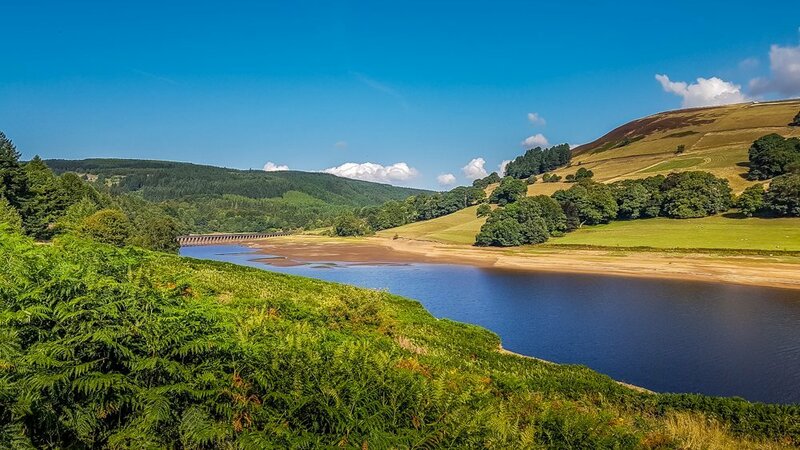 There’s plenty of parking beside Ladybower reservoir, either in designated bays on the A57 or near the visitor centre for the Derwent Dams where you’ll find hot and cold drinks available, light bites including cake and of course a toilet block. Parking near the visitor centre is by parking metre but there are parking places along the road available for free on a first come first served basis, if you don’t mind walking just that little bit further, which we don’t mind in the least especially when the scenery is so beautiful. 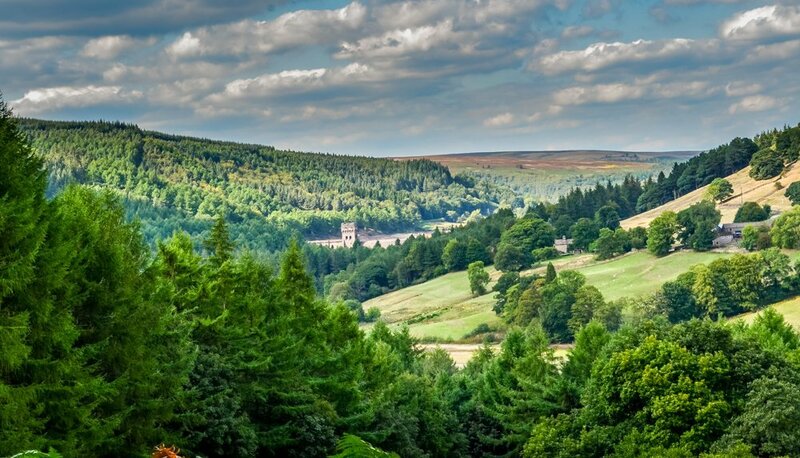 Walking toward the visitor centre and past the WWI Ashopton war memorial, the way up can be found to the left and leads up through the pine trees giving views of Ladybower reservoir and as the track ascends further you may just catch a glimpse of Derwent Dam through the trees. 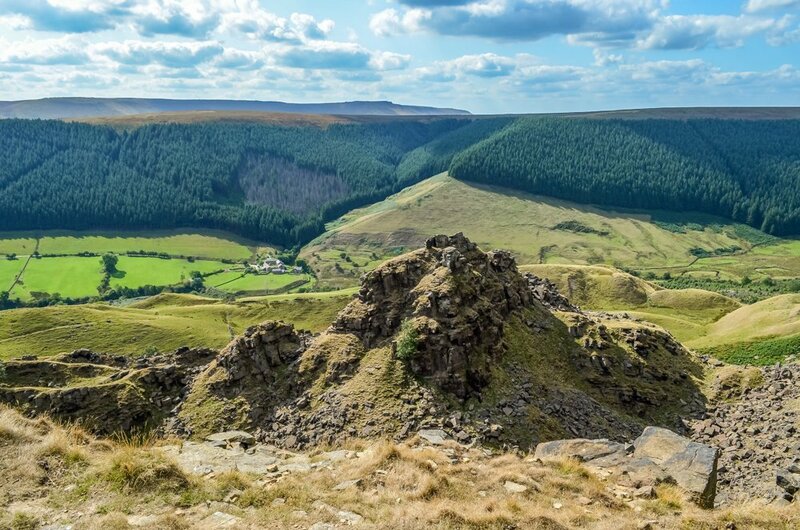 There are many ways up to Alport Castles including one that is closer to the visitor centre if parked in the car park, so use the route closest and that suits you. Once to the top of the track the sign post shows the way, to the right, sign posted as Pack Road to Alport Bridge, though if you intend to head to Alport Castles keep following the higher path. The views from here on are gorgeous, you should be able to make out, Win Hill on the left, and if you’ve a keen eye you can see Mam Tor and even on a clear day, Hope cement works. Looking toward the valley and to the right is Snake Pass A57 which is a Pennine route from Sheffield to Manchester. 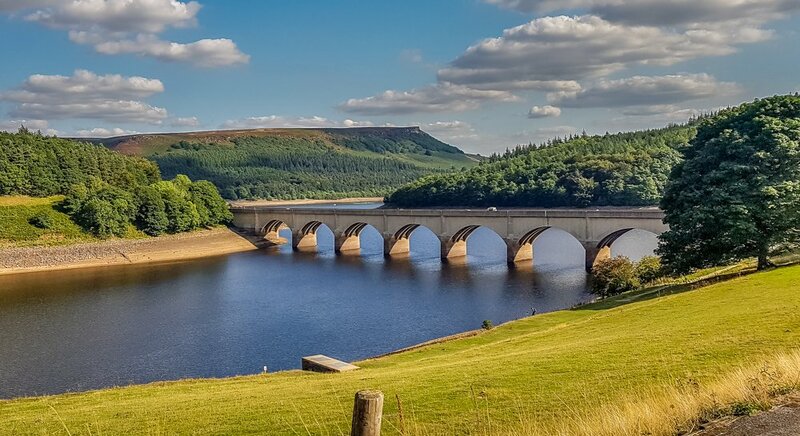 The A57 crosses Ladybower reservoir over the Ashopton viaduct before winding through the valley and up to Glossop before finally reaching its destination of Manchester. This Pennine route is often closed due to heavy snow and ice in the depth of winter because of the danger it poses to driving through this remote area with sharp bends and sheer drops at times along the road. 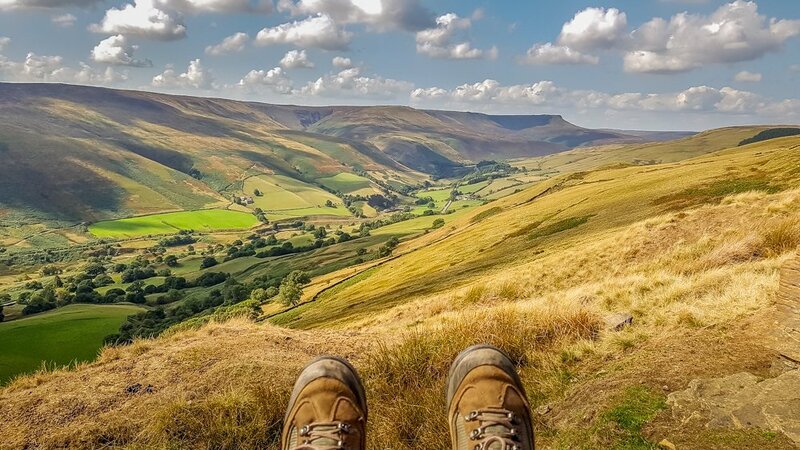 The walk now is just scene after scene of beautiful landscapes, the miles don’t seem to count once you’re up on the moorland, taking in the fresh air and stunning views. 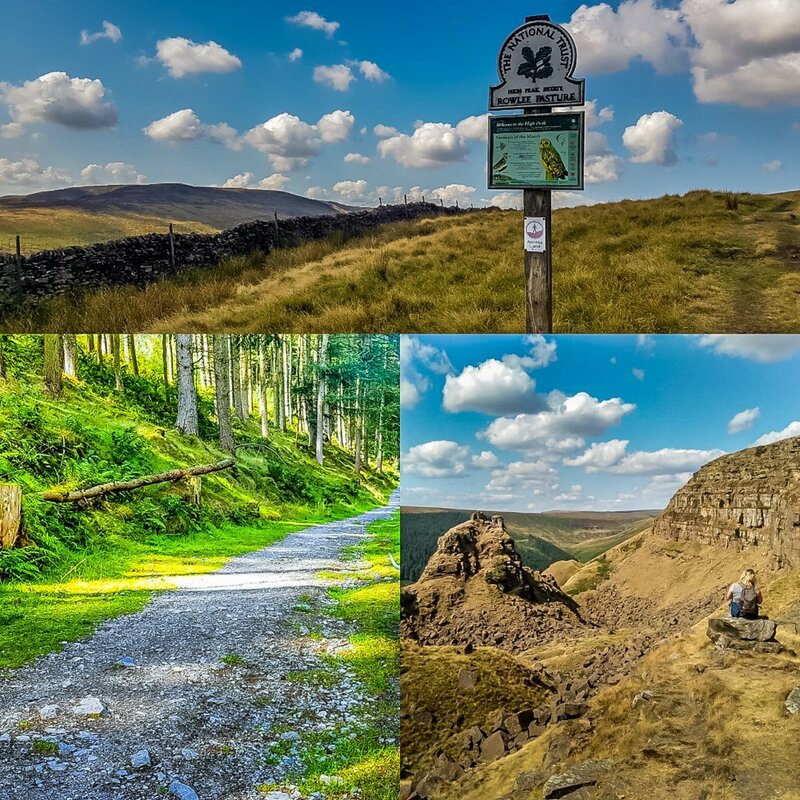 The trail is a well kept one and for a large section is also slabbed which I imagine during bad weather can be an absolute savior, there are some serious bogs across the moorland that I would not want to venture into, I’ve done it before, got the tee shirt as they say! On that fair weather walk the slabbing became sunbeds for lizards, my daughter, who had been walking a few steps ahead, spotted a lovely Common Lizard who had been basking on one of the stone slabs, so I did my best at taking a pic. 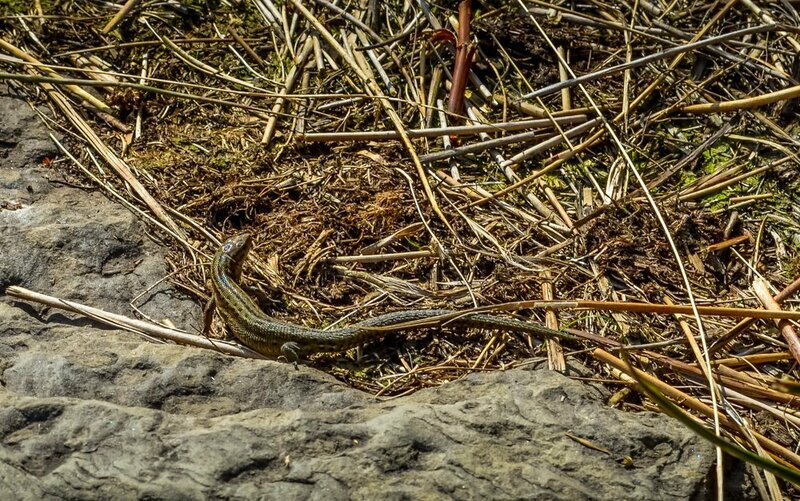 It is nice to spot a lizard, only one of a few that we’ve spotted in the high peak area, on sunny days they’re often basking on rocks if you are lucky enough to notice them. 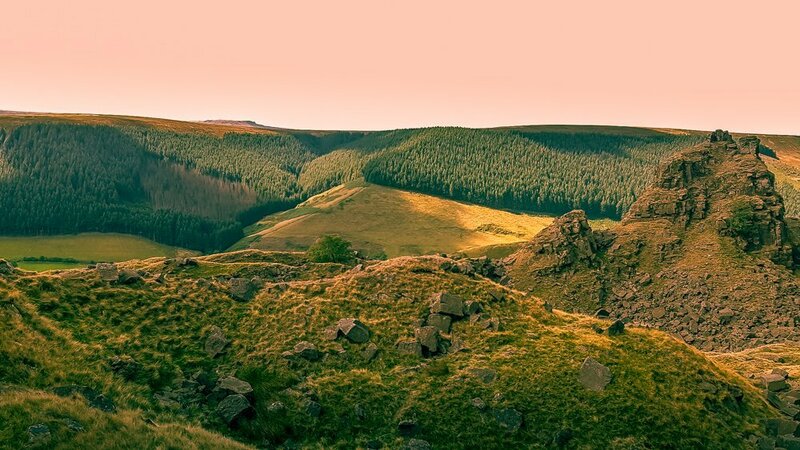 When the stone slabbed path comes to an end, Alport Castles will soon be in sight, first you’ll notice the large grassy mounds that spread out quite a distance before the Tower becomes evident in-between the cliff face to the right and another outcrop to the left. As afore mentioned, the landslide stretches out for over half a mile, the cliff face shows layers of rock where this giant landslide slid away from. Some of the area is unstable as the weather makes its mark and keeps restructuring parts of the outcrops and as such it’s been said not to be climbed on. Personally, I feel it is a wonder to admire the ruggedness of the cliffs and outcrops, especially the magnificent Tower. 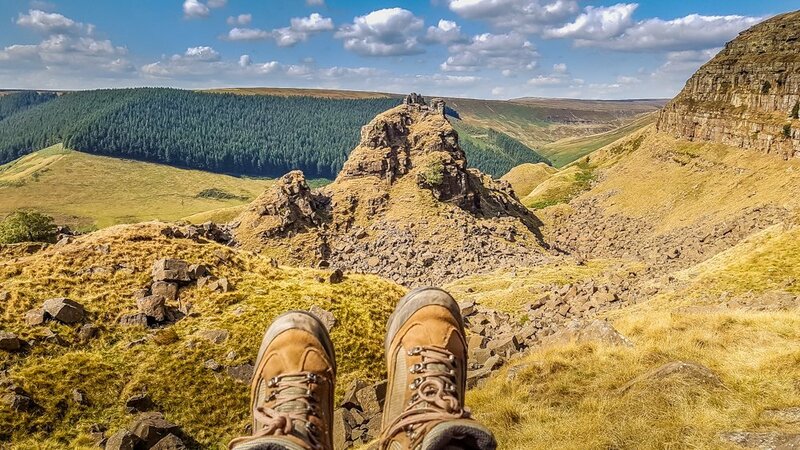 Sitting a top of a big rock and chilling out in the sunshine is reward enough for this peak district family walk and a fine spot for lunch. I’d say it is an easy to moderate walk on a dry day and the whole distance up to Alport Castles including return journey is approximately 15km, (9.5miles) I take this figure from my eldest son’s app that measures the distance of his walk or run while on his travels. That’s some fantastic family history you have. What a proud moment that must have been for your Great Grandfather too. Some of the foundations of the Ashopton village have been reappearing since the reservoir water has receded this year. 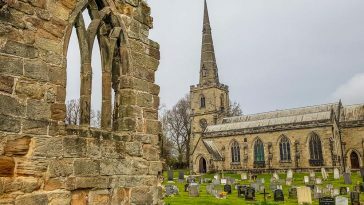 Such a sight to see and a very interesting peice of local history reappearing. Thank you very much for giving me more insight into this lovely place. 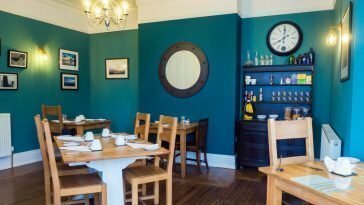 Nice to hear about your family links with Ladybower and Ashopton village. Beautiful photos! 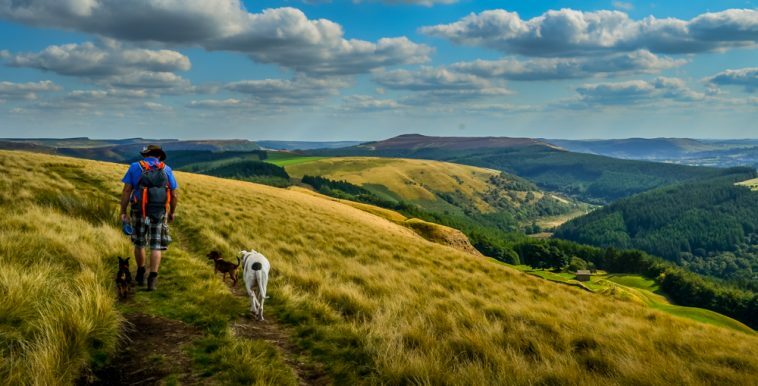 Looks like the perfect day for a walk in the Peaks. Thanks so much Helen. 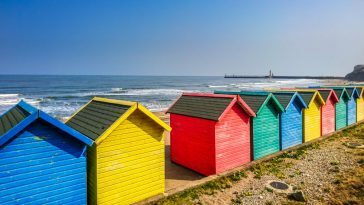 It’s such a stunning area, you’d love it there, I’m sure.